Why do Fishermen Break the Law? Why do fishermen sometimes break the law? This is a question I think on a lot, and I even consider one day studying this compliance question as a PhD student (program suggestions are more than welcome!). 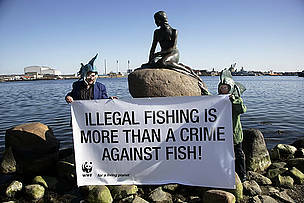 As I see it, a great deal more needs to be done to understand the phenomenon of illegal fishing. To date, the majority of research into illegal fishing has considered the economic decision-making of fishermen. For example, Sumaila et al (2006) explain that illegal fishing is the result of individual decision-making that considers the costs and benefits of the activity. They consider such variables as the benefits to be realized from illegal fishing, the probability and costs of getting caught, and the costs of avoidance activities. The authors point out that there are also “social and moral drivers” without explaining what they might be. In the same vein, Hilborn et al (2005) explain that successful fishery management systems will usually involve institutional arrangements that provide positive economic incentives to individual operators. And Le Gallic and Cox (2006) ostensibly build on the papers by Sumaila et al and Hilborn et al with an excellent discussion of the systemic distortions in the costs and benefits of illegal fishing. Overcapacity, weak enforcement (and thus TOTC), the availability of tax havens, organized crime networks, and poverty all are identified as significant contributors to the global illegal fishing epidemic. While I agree that economic explanations are powerful, I also believe that they are insufficient, and that the “social and moral” drivers hinted at by Sumaila et al may be equally important. And as we go forward, we ought to consider the intangible elements far more. The costs of enforcement and potential benefits of illegal fishing will only go up as global population increases and more and more fisheries fall under regulation. [P]eople who respond to the moral appropriateness of different laws may (for example) use drugs or engage in illegal sexual practices, feeling that these crimes and not immoral, but at the same time will refrain from stealing. Similarly, if they regard legal authorizes as more legitimate, they are less likely to break any laws, for they will believe that they ought to follow all of them, regardless of the potential for punishment. A number of situations come to mind where personal morality and questions of legitimacy may contribute to illegal fishing. For example, though Linda Greenlaw (1999) romanticizes the lives of fishermen in her book The Hungry Ocean, she also points out that many fishermen are highly transient and risk taking, embracing a life of alcoholism and drug-abuse. This suggests that some fishermen may have personal moralities that would facilitate rule breaking at rates much greater than the general population. Further, common complaints of fishermen at times of regulatory reform is that the government has fallen under the control of environmental groups, and that they are getting the science wrong. Such would suggest that fishermen may regard the ‘government bureaucrats’ and their rules as illegitimate. What might we learn from greater research into the normative aspects of fisheries compliance? Perhaps we might go so far as to say it would teach us how to better design fisheries management systems, from finding “just” rules for constraining behavior to legitimacy building modes of stakeholder engagement, policy-making, scientific assessment, communicating, and enforcement.